The 80’s was the start of the bull market economy. You could invest your money in bonds which were paying out at a flat 15% interest rate, risk free. It was a good time to invest in companies because the corporations were forced to compete with 15% rates to be more efficient and investing their capital wisely. Every project is different so it is not possible to compile an exhaustive list of project funding risk or to rank them in order of priority. What is a major funding risk for one project may be quite minor for another. One can discuss the risks that are common to most projects and possible avenues for minimizing them. However, it is helpful to categorize the risks according to the phases of the project within which they may arise: (1) the design and construction phase; (2) the operation phase; or (3) include both phases. It is useful to divide the project in this way when looking at project funding risks because the nature and the allocation of risks usually change during and between constructions. 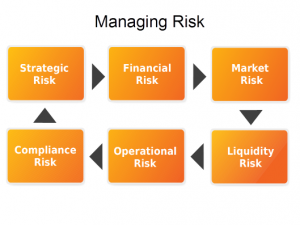 In our “writing a business plan” article, we highlighted “managing risk” in a bullet points because it’s an essential element in your business plan. This article explains further why we feel that this (managing risk) is another factor to consider when writing a business plan. Strictly speaking, these aren’t the only risk assessments your company should undertake but it is a small guideline to show you how one factor can possibly effect the other. There’s different options for project principals to raise capital for their project. Corporations can apply for large project finance from institutional investors, venture capital and boutique banks. These financial bodies can utilise bank instruments and private placement platforms to build up initial funding to start cash flow and progress with funding activities. Since Brexit (UK exit from the EU) the worlds markets are looking very uncertain. The Pound is weak against the Dollar and Euro thus creating instability and a knock on effect to other EU countries. Staying afloat is the first thing that every CEO worries about. Commercial developments can cost millions to purchase or build thus potentially command huge rental incomes. Despite the upside and potential revenue which projects can generate through commercial transactions, funders most prefer to help those that have flourished or have some equity in place. This makes it rather difficult for startup development companies to get the necessary seed funding. Years ago, the petroleum industry relied on rig counts to drive energy prices forward to see rewards in pure crude oil and natural gas trading. Today they remain key drivers of industry growth despite a slowing economy, a need for greener technology and the market becoming more complex in general. Thus said, there is still a high number of wells drilled and enough oil in the mature oilfields to see through the next 40 years. Corporations have to change their methods to include technological advances through research to help find new opportunities in the market.